More about Back Benches, and a plug from the Green’s AGM. I’m just a decade or so outside the boundaries for participation in the Young Greens, but due to my years as a mature, post-grad student at VUW, I know a lot of energetic young people who have gone places in the Greens’ networks. I’d just like to give a plug for a speech by new Young Greens Co-Convenor Jackson Wood, which you can read here. Back Benches is still rolling along, last week’s episode involved the sterling efforts of Kennedy Graham to prevent spin from clouding facts on International Relations – you can watch it here. Coming up, this Wednesday the show goes on tour again, with an initial filming at the Britomart Country Club in downtown Auckland. See Auckland Central MP Nikki Kaye perform on a panel with Green’s co-Leader Dr Russel Norman, Winston Peters from NZ First, and new Labour Leader David Shearer. This will be interesting, to put it mildly! More details at TVNZ On-demand’s website. More Back Benches to come! Haven’t done a post about Back Benches for a while. Not because I haven’t been attending (I have had the soggy overcoat to prove my dedication) but because other things going on in my life have interfered with writing posts for a while. So here’s a compendium of reviews of the past two shows and a plug for the next one. The first one (22nd Feb) was very busy, the bar was crowded and the topic in hand was the Christchurch earthquake anniversary. Christchurch MP’s were on the panel – Liane Dalziel (L), Nicky Wagner (N), Kennedy Graham (G) and Denis O’Rourke (NZ1). They had all been at commemoration events during the day in Christchurch, then flown to Wellington to be on the show, so kudos for that. The media coverage of the days events was pretty much wall-to-wall, and the MP’s referred to where they’d been under the assumption that non of the audience could possibly have missed seeing footage. The following week was ‘leap day’, 29th Feb, and a re-shoot of the Hamilton show that didn’t get broadcast during the summer tour. The pub was barely filled, and I was surprised to be invited, with my young companion (a friend’s son) to move to another, closer table so that the cameras had some audience to film. So we did, and ended up sitting right next to National MP David Bennett’s wife and daughter, who both got spots speaking with Damian Christie. Other MP’s on the panel were Cath Delahunty (G), Sue Maroney (L) and Richard Prosser (NZ1). Students with or without jobs got a fair bit of airtime, especially given recent announcements by the Minister for Social Development during that week’s press on welfare reforms. This week 7th March, the line-up is Labour MP Rino Tirikatene, Dr. Cam Calder (Nat) and Denise Roche (Green) – still from 8pm if you want to get a drink beforehand, at the Back Bencher pub, opposite Parliament in Molesworth St, Wellington. There’s been some good young Green crews along in the past, now that Orientation is on again, might be nice to get some more yoof down to the pub for a bit of a laff, eh? 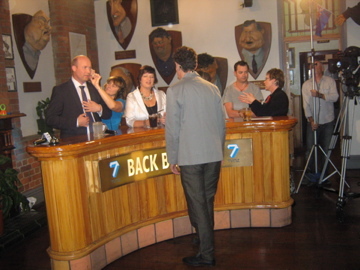 That was a very good night out, episode here and here’s a quick pic from before filming began showing all the panellists. There’s still time to email TVNZ about saving TV7, have a look here. 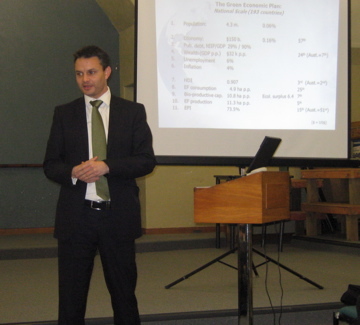 Last night in Karori, the Wellington Central electorate had one of its first public meetings of the campaign period. Outgoing MP Sue Kedgley, who has stood in Wellington Central for four consecutive terms of Parliament, hosted new Candidate James Shaw and sitting MP Dr Kennedy Graham, from Christchurch, for an evening of presentations and discussion about sustainable options for our economy, a smart green economic plan which has been rolling out in stages over the past couple of months. Dr Graham spoke first, detailing the development of global policy initiatives developed during his time with UNDP – from the 1992 Rio Summit on Climate Change forwards, he has been in the vanguard of those trying to quantify, and provide a matrix of solutions for, a range of climate issues. He was our Green MP at Copenhagen 2010, and gave a sobering presentation on the changes that have occurred since that first conference in 1992. The win over ozone depletion of atmosphere was the best outcome of those years, but we have lost biodiversity, and seen global CO2 emissions rise far outside the protocols first discussed, then reviewed at each subsequent Climate Conference. The time is now at hand to be bold and bring our country into the possibility of a bright green future; it is not a time to sit on our hands and continue to say, ‘We’re so small, our emissions don’t rate against the big economies of China or the USA’, which is a cop-out taken by too many local commenters. James Shaw then took the floor, and delivered an impressive presentation of the three key policies that the Greens are working on this election, to alleviate the pressures on kiwis that have been exacerbated by the global recession – Addressing Child Poverty in NZ, launched by Metiria Turei in West Auckland, Cleaning up NZ’s Rivers, launched by Dr Russel Norman in Wellington’s Waitangi Park just ten days ago, and a sneak peek at the next policy around energy sustainability, which I won’t go into here because it’s being launched on the 21st September, a mere three weeks away, so look out for the media on that when it happens. Best one-line of the evening to James – “as Clinton said, ‘It’s the economy, stupid!’, or as Kennedy put it, ‘It’s the stupid economy! 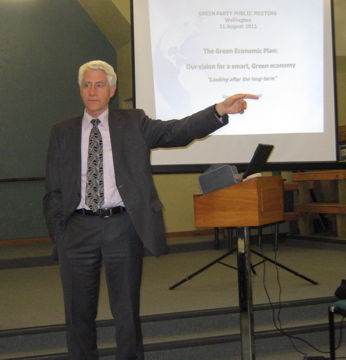 '”; which followed on from Dr Graham’s rather sobering facts and figures very well, as the discussion turned to ways of improving both our economy and our sustainability. Sorry about the late notice about this, but it’s been around the internal networks, so excuse me if I just give a brief overview, then I’ll try to report back on how it went. This has been organised by Dr Russell Norman and Dr Kennedy Graham, with a keynote speech by Dr David Suzuki, as part of his australasian tour. There are 4 sessions covering Global Sustainability, A Sustainable National Economy (in two parts, Business, agriculture & labour, then Monetary & fiscal policy; Trade & investment policy; & Energy & climate policy) and Political Perceptions of Sustainability. These have panels of speakers including academics, politicians and industry representatives. Kennedy has blogged about it here on Frogblog. Ken’s post is here, and video of Suzuki’s speech is here, credit due to excellent filming by Jackson Wood of the frogblog crew. Oh, dem pesky polls – giz us enough votes for Mojo! After a couple of polls that have been poor for the Greens, the latest Roy Morgan Poll puts the Greens at 8%. Now, 8% means 10 or 11 seats in Parliament, depending on the overhang and the wasted votes that might go to NZ First – who are looking increasingly like electoral dog food and according to the Roy Morgan Poll are polling at 2.5%, and that before the worst of the revelations about their electoral finance declarations. So that 8% would get all the current Green MPs elected, plus Kevin Hague, Catherine Delahunty, Kennedy Graham, David Clendon, and (possibly) one of the youngest Green candidates, Gareth Hughes. This would give a real boost to the Greens in the composition of the next Government, because, unless the Maori Party were to support National, as a result of a deal over the Foreshore and Seabed Act, the figures indicate the Greens are crucial to the formation of the next Government. Now, on the basis of this poll, and that the National Party are unlikely to agree to repeal of the Foreshore and Seabed Act (which the Greens opposed through its passage, and still vehemently argue for its repeal), there is a great opportunity for the Greens. A few dead rats might have to be swallowed by either of the two best polling parties to form a Government. But the Greens can do better! Let’s look to get at least 11%. 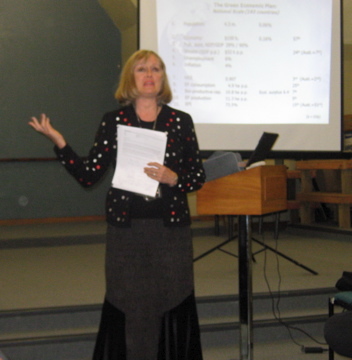 That figure would really set the proverbial cat amongst the pigeons at Parliament, because it would elect Mojo Mathers as New Zealand’s first profoundly deaf Member of Parliament. Mojo has impeccable credentials on both environmental and social issues. Her election would require Parliament to give some real consideration to enabling people with impairments. And that can be only a good thing!